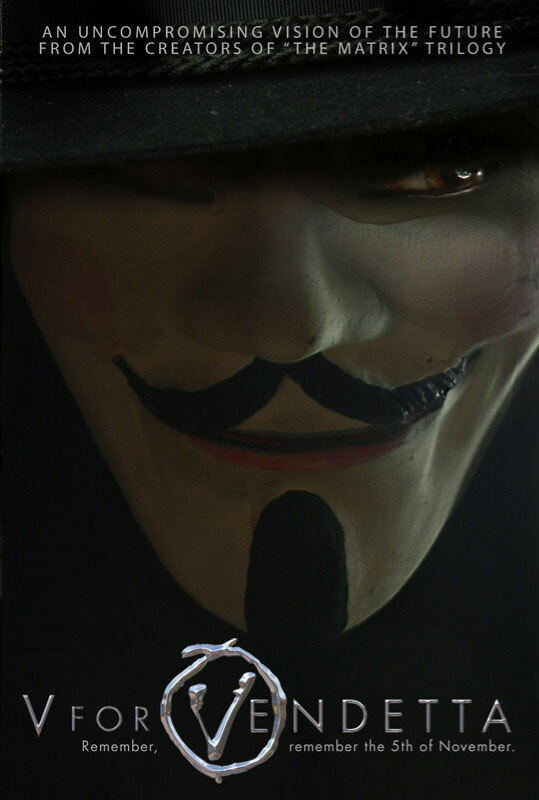 As of May 31, all news regarding the movie will now be posted on my V for Vendetta Movie Blog. The blog itself is a bit of an eyesore at the moment, but I'll be taking care of that soon. Using a weblog will make posting news much easier for me, and more immediate for you. Check out the V for Vendetta Movie Blog for the latest movie updates. Eventually, the information on this page will be transfered there..
Hugo Weaving has replaced James Purefoy as "V"! As reported on Sunday by Reuters and Variety, Purefoy has left the movie for "undisclosed reasons". Hugo Weaving is best known for his role as Mr. Smith in The Matrix Trilogy, and Elrond in The Lord of the Rings, as well as the cult favorite "The Advetures of Priscilla, Queen of the Desert". The movie has been filming in Berlin since March 7. What this significant cast-change means for the production, if anything, is unknown. It has been confirmed that the film will be directed by James McTeigue. McTeigue has been as assistant director throughout his career and, most notably, was the first A.D. for both the Matrix trilogy and the Star Wars prequels. Filming is set to begin on location in Berlin on March 7, 2005. Recently Stephan Fry has confirmed he will be playing the role of Gordon. Also cast are John Hurt as Bishop Lilliman, Tim Pigott-Smith as Edward Finch, and Sinead Cusack as Dr. Deliah Surridge. Previous casting news has confirmed that Stephen Rea has been cast as Lewis Prothero; I'm presuming he will play Finch, but I have no official confirmation. Rupert Graves posted on his website that he has been cast as Dominic. James Purefoy had been originally cast as V. Natalie Portman signed on to play Evey Hammond at the beginning of the year. The Wachowski Brothers have been hoping to make a movie of Vendetta for years. The presumption had been that they would direct the film, although with McTeigue in the director's chair, the Wachowski's will be acting as producers, along with Joel Silver. Though information about the movie is scarce, details are emerging. Variety has described the movie as taking place "in an alternate future in which Germany wins WWII and Great Britain becomes a fascist state." Whether this means the fascist government in power is no longer Norsefire, or if Norsefire will simply have grown as an offshoot of the Nazi party has yet to be confirmed. Fry says the movie has Gordon as "chat show host who questions the authority of the people who run Britain in this post-viral facist state." Also, the The Voice of Fate will be known as The Voice of London, and it is broadcasted on television, not radio. Empire Online, in their playful article regarding Portman joining the cast mentions that the character of Evey "begins to develop feelings for V, a superhuman force of nature who speaks primarily in rhyme and quotations, and realizes that she has a major part to play in his campaign against the fascist government." This implies that Evey will fall in love with V, romantically. But again, this is inference without confirmation. Because so many entertainment sites repeat the same information, I am keeping my links limited. However, if you know of a site that features information not mentioned in these links, please feel free to contact me at vendetta@shadowgalaxy.net. My thanks to everyone who has written me to keep this page current: Tom Turner and Andrew Hoss for first alerting me that it the movie would finally get out of the starting gate and for letting me know that the movie's website was up and running; Thomas Strickland who informed me about Natalie Portman; Trish for alerting me about Rupert Graves; Gordon for letting me know about Stephen Fry; and The Velvet Forum for various tidbits, images, and casting news.